With the development of LED display technology, LEDs are increasingly being used in large-scale events in TV studios and television broadcasts. As an active backdrop, it provides a variety of vivid, dazzling background images and more interactive features. The background image is also moving and quiet, so that the performance and the background are integrated, which perfectly integrates the scene and the atmosphere of the program, and realizes the functions and effects that are difficult to achieve in other stage art equipment. However, in order to take advantage of the advantages of LED display, the following aspects should be paid attention to during the selection and use. As mentioned in the previous discussion about dot pitch and fill factor, LED screens with different dot pitches and different fill factors have different shooting distances. For example, an LED display with a dot pitch of 4.25 mm and a fill factor of 60%, the distance between the person being photographed and the screen is 4-10 meters which is suitable, so that a good background image can be obtained when shooting a character. If the character is too close to the LED screen, the background will appear grainy when shooting close-ups, and it will also be prone to texture interference. The dot pitch is the distance between the center points of adjacent pixels of the LED screen. The smaller the dot pitch, the more pixels per unit area, the higher the resolution, the closer the shooting distance can be, and of course the more expensive it is. 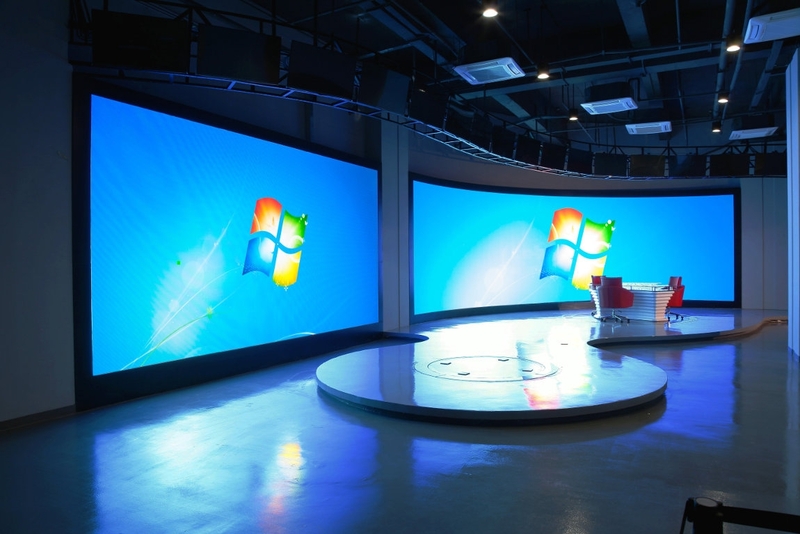 At present, the dot spacing of LED screens used in domestic TV studios is mostly 6-8 mm. It is necessary to carefully study the relationship between the resolution of the signal source and the dot pitch, and strive to achieve consistent resolution and achieve point-to-point display, thus achieving the best results. When the studio uses the LED screen as the background, its color temperature should be consistent with the color temperature of the studio, in order to get accurate color reproduction during shooting. The lighting of the studio is sometimes based on the demand of the program, sometimes using 3200K low color temperature lamps, sometimes using 5600K high color temperature lamps, and the LED display screen needs to be adjusted to the corresponding color temperature to obtain satisfactory shooting results. The lifetime and stability of the LED screen are closely related to the operating temperature. If the actual working temperature exceeds the scope of use specified by the product, not only will its life be shortened, but the product itself will also be severely damaged. In addition, the threat of dust cannot be ignored. Too much dust will cause the thermal stability of the LED screen to drop or even cause leakage, it will cause burns in severe cases, the dust will also absorb moisture, which will corrode the electronic circuit, causing some short-circuit problems that are difficult to check, so pay attention to keep the studio clean. The LED screen has no seams, which can make the picture more perfect,lower power consumption, lower heat, energy saving and environmental protection; it has good consistency, can ensure the display of the screen without difference. The cabinet scale is small, is easy to make the background screen smooth and styling.The color gamut coverage is higher than other LED display products.it has the advantage of better weak reflective characteristics, and has high operational reliability and low operating and maintenance costs in the later stage. Of course, the led screen with so many advantages must also be used well to make its advantages stand out. Therefore, we have to choose the right LED screens when in the use of LED screens in TV programs, to understand their characteristics,to select technical products as background in different studio conditions, program formats and requirements, so that these new technologies can maximize their advantage.